$5.540 million on 943 screens. Is there anything funnier than a guy in a dress? Well, yeah - quite a lot of images and topics are more amusing than men in drag, but that doesn’t mean such a sight can’t still provoke humor. 25 years after its release, 1982’s Tootsie stands as one of the best-regarded films within this genre. Along with 1959’s Some Like It Hot and 1993’s Mrs. Doubtfire, Tootsie stands tall in this trifecta of trolls. 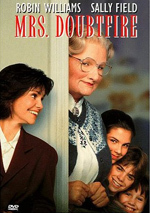 Of the three, only Doubtfire failed to make the original AFI Top 100 Films list. Hot placed an amazing 14th while Tootsie landed in the 62nd spot. 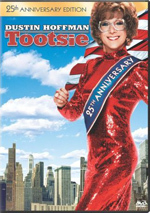 Tootsie tells the story of struggling actor Michael Dorsey (Dustin Hoffman). Though no one denies that Michael’s enormously talented, his harsh perfectionism has made him virtually unemployable. He’s cheesed off so many professionals that no one will give him work. Michael remains dedicated to his art, so he continues to try to get a role. He also wants to raise $8000 so he and his playwright roommate Jeff (Bill Murray) can stage a new production in upstate New York. When his insecure actress friend Sandy (Teri Garr) doesn’t get a part on a soap opera, Michael decides to show his true talent: he dresses as Dorothy Michaels and tries out for the role him/herself. When Michael/Dorothy wins the job, a double existence begins in which Michael has to try to balance both personalities. While this would be complicated under the best of circumstances, since Tootsie is a comedy, problems churn almost immediately. Early into Michael’s dual existence, a compromising situation in front of Sandy almost betrays his alter ego. He doesn’t want her to know that he got the job; she’s insecure enough without the pain of losing to a dude in drag. As such, Michael fakes an attraction to her and beds her to further this charade. From there, a semi-relationship begins, though Michael constantly stands up Sandy because of his love for Julie (Jessica Lange), one of his co-stars on the soap. She warms up to Dorothy, which oddly gives Michael hopes for a romance between Julie and himself although Julie doesn’t know Michael exists. Things go even more awry when Julie introduces Dorothy to her widower father (Charles Durning) and he promptly falls for her. All of that confusion, and I didn’t even bring up subplots that involve Julie’s affair with the lecherous soap director Ron (Dabney Coleman) or the lustful ways of co-actor John Van Horn (George Gaynes). Yes, Tootsie is a screwball comedy, one that flings nutty relationships and scenarios with abandon. Nonetheless, the movie feels nicely focused. With all of these elements, it has the potential to become a mess and to lose sight of its main characters, but this never happens. Parts of Tootsie haven’t aged well over the years. It pushes a proto-feminist agenda in which we see how tough it is for a woman with all of those horrible men around them, and that theme gets old quickly. Sure, it’s interesting to see Michael get in touch with his feminist side, but since he was never a bad guy from the start, the anti-male elements come across as heavy-handed. Despite those missteps, the movie succeeds. Much of the credit goes to the outstanding cast, all of whom turn in fine work here. Hoffman never seems totally convincing as a woman, though I completely buy him as a pushy, demanding actor. That’s probably since Hoffman has a reputation for being difficult, and it’s delightful to see him poke fun at himself. I’m not sure Michael’s a full-blooded human being as performed by Hoffman, but he balances the different elements of the role nicely and holds together the film. The supporting actors are also terrific. Lange won a Best Supporting Actress Oscar for her turn as Julie, and though I don’t think she really deserved it - I prefer the work by Garr, who was nominated along with Lange - she does well in the role, especially since it was the most thankless of the bunch. Julie’s really the straightwoman in a cast of comic personae, and Lange adds life and humanity to the role. Still, it’s a comedy, so it seems odd that the only performer formally honored for the movie was the one who had no comic bits. That’s why I’d pick Garr, who’s consistently witty and lively as Sandy. In some ways, it’s an easier role since Sandy gets to be a broader personality, but that shouldn’t underestimate Garr’s success in the part. In addition, Murray turns in one of his all-time great bits as Jeff. The character doesn’t stray far from the usual Murray territory, but he gives him such a wonderful deadpan tone that he makes his fleeting moments on screen seem lasting. Do I think that Tootsie is one of the 100 top films ever made? Nope. Do I feel that it should rank as the second-best comedy to date? God no, though that’s where the AFI put it on their “100 Top Comedies” list. Nonetheless, I do find it to offer a generally entertaining and amusing experience. Some parts of it haven’t aged well, but as a whole it’s a fun and well-executed film. 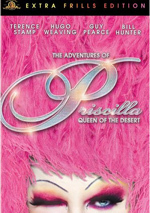 Tootsie appears in both an aspect ratio of approximately 2.35:1 on this single-sided, double-layered DVD; the image has been enhanced for 16X9 televisions. This was a reasonably good transfer but not one that excelled. Sharpness generally looked pretty solid. Some moderate softness crept into wider shots, but not to a tremendous degree. Instead, the majority of the film demonstrated positive delineation. I saw no problems related to moiré effects or jagged edges, but some light edge enhancement cropped up through the flick. At least print flaws were essentially absent. The movie appeared rather grainy at times, but no specks, marks or other concerns showed up during this clean presentation. Colors appeared natural and appropriately vivid. The movie featured a fairly subdued palette but the hues looked clear and accurate throughout the film, and they showed no signs of bleeding, noise or other concerns. Black levels could be slightly muddy at times, but they generally were acceptably deep and dense, and shadow detail looked appropriately opaque but not too heavy. Ultimately, Tootsie provided a reasonably satisfying visual experience. The Dolby Digital 5.0 soundtrack of Tootsie offered a remix of the film’s original monaural audio. In theory, at least, as I never differentiated any audio from the sides or rears. This track focused tightly on the center; if it ever opened up at all, I didn’t notice. Audio quality was consistently good. Dialogue always sounded warm and natural, with no signs of edginess or problems related to intelligibility. Some slightly thin tones came through via the speech, but these were quite minor and were typical of movies from the period. Effects seemed like a small part of the equation, but they sounded acceptably realistic and clear, with no distortion to mar them. The music appeared decent and showed pretty nice range at times; the pop songs demonstrated particularly nice low-end response. Ultimately, the soundtrack of Tootsie was a modest but satisfying affair that worked fine for the movie. How did the picture and audio of this “25th Anniversary Edition” compare to those of the original 2001 release? The visuals provided minor improvements. Actually, I thought the two looked a lot alike except the 2008 DVD was cleaner; it eliminated the minor flaws that marred the prior disc. That was enough to make this a “B-” transfer compared to the “C+“ of the 2001 release. In terms of audio, I thought comparisons were a wash. On one hand, the 2001 disc’s 5.1 soundtrack actually used the side speakers in a minor way; it was glorified mono, but that beat the monaural mono of the 2008 release. On the other hand, I thought the new disc sounded a little better, particularly in regard to musical reproduction. Both remained very similar, though, so I gave them identical “B-“ marks. While the old disc included very sparse extras, the “25th Anniversary Edition” provides some bonus materials. We start with a one-hour, eight-minute and 54-second documentary called A Better Man: The Making of Tootsie. It mixes movie clips, archival elements and interviews. We hear from director Sydney Pollack, screenwriters Murray Schisgal and Larry Gelbart, and actors Dustin Hoffman, Teri Garr, Jessica Lange, and Dabney Coleman. “Man” looks at the project’s origins and development as well as how Pollack came onto the flick and his take on the material. The program then goes into Hoffman’s approach to the lead role, other cast and characters, costumes and makeup, rehearsals and more changes. From there we hear about performances, shooting a few specific scenes, and thoughts about the finished product. When I got this DVD, the lack of an audio commentary disappointed me. However, much of that disappointment dissipated as I watched “Better Man”. The program covers the film awfully well and really digs into the nuances of the production. It proves more introspective than most; while it includes the usual nuts and bolts, it gives us plenty of fine insights about motivations and deeper subjects. It becomes a really great show that tells us tons about the flick. Nine Deleted Scenes fill a total of eight minutes, five seconds. These include “What a Surprise” (1:22), “I Made You Some Soup” (2:35), “Anybody Home?” (1:22), “Amy Let Go” (1:03), “Your Own Character” (0:15), “You Can’t Play An Animal” (0:12), “I’m a Virgin” (0:35), “Wrong Door” (0:17), and “Signing an Autograph” (0:20). The first two are the most interesting. “Surprise” shows a somewhat humiliating encounter between Michael and a prior girlfriend that serves to remind us of his career failures, while “Soup” gives us a little more goofiness between Michael and Sandy as he tries to cover his tracks. Neither is particularly valuable, but they’re more compelling than the other snippets, as those tend to be forgettable. Finally, we get two minutes and 40 seconds of Dustin Hoffman Screen Test Footage. The material comes from May 1981 and shows the initial shots of Hoffman in drag. Wow – Dorothy was never an attractive woman, but she looks like Playmate of the Year compared to this initial attempt at Hoffman as a woman! Hoffman is actually pretty terrible in the part; he did much better in the final film. Still, it’s cool to see this early footage. Even though the old disc didn’t offer many extras, the 2008 release drops those components. This means we lose some text production notes, filmographies, and “bonus trailers”. None of these are painful omissions. If the set had dropped the Tootsie trailer, that’d be one thing, but that clip fails to appear on either disc. While I believe that Tootsie is over-rated, I do enjoy it. Tootsie is a classy comedy that offers quite a lot of solid humor despite a few missteps. It works because of a terrific cast, all of whom provide fine work. The DVD looks and sounds decent, though it’s not spectacular in either area. As for the extras, it doesn’t include many, but the elements we find are excellent. This isn’t a great DVD, but it’s a decent upgrade from its predecessor, mainly due to the excellent documentary.